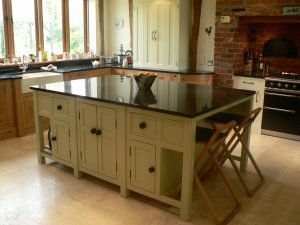 Kitchen islands are great for extra storage and worktop space but can very very sociable areas too-many a cup of coffee or glass of wine has been drunk around ours. This island has it all plenty of storage in large cupboards and beaded drawers with an open end in which to tuck a couple of stools, the other end has an open slatted wooden base-great for storing large bits and pieces or filling with baskets. 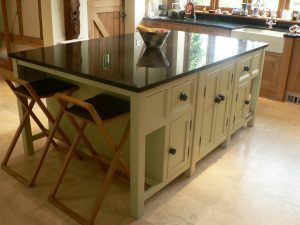 This kitchen island with seating space has a granite top but the price shown is for a treated pine worktop. Unfortunatly we can only supply granite worktops in our local area of Wetherby, West Yorks as we work with a local company in our area, if you would like granite tops on your units we are happy to supply units without worktops-please drop us a line for a discounted price! If you wish to upgrade to an oak worktop please add £254.Delivery within 250 miles is free,the island may be delivered in sections and some assembly is required-this is not included.